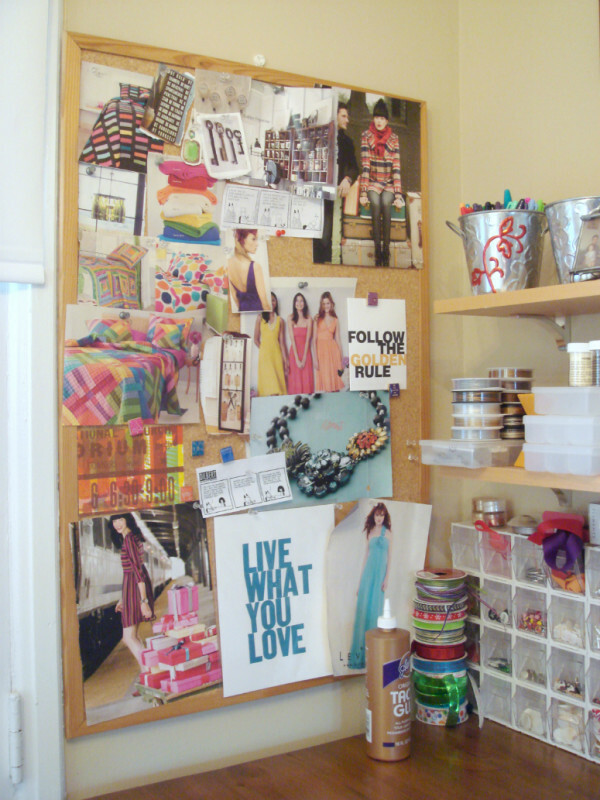 This week’s studio space post comes from Kate Amarelo of Kamarelo Designs, Colorful Jewelry for Colorful People. While Kate and I both live in the DC Metro area, we didn’t get to meet in person until a recent Spark & Hustle event with Tory Johnston. 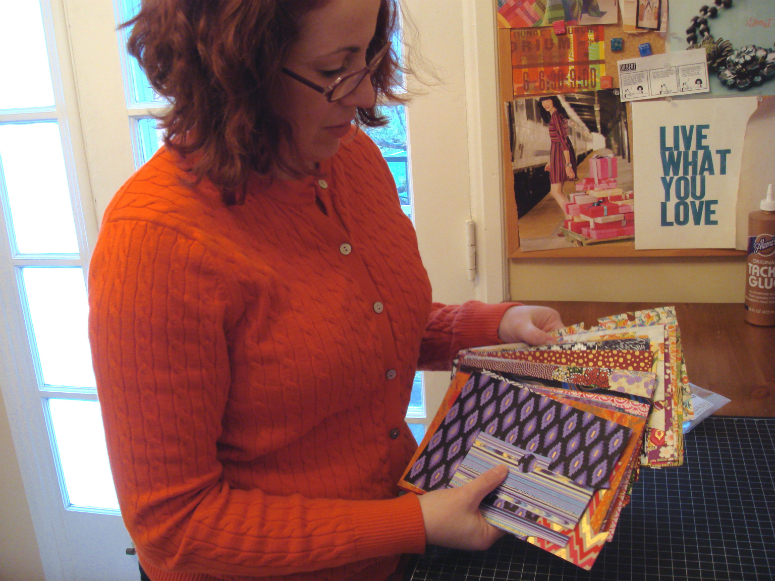 Kate has a love for color, similar to mine – so it was great to meet another jewelry designer and take a peek into her work space! So here we go with the Q & A portion! Tell us a bit about your workspace and why you set it up that way? I live in an apartment that’s on the National Register of Historic Places. It’s very cute which is code for small. Falling in love with the place made me stretch a different side of my brain – how to decorate a small space without getting cluttered. 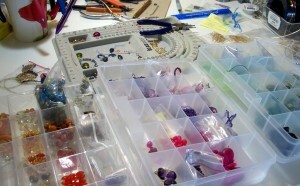 My jewelry making/life/clothing philosophy is to keep it bright – my space very much so reflects that philosophy! Having so many colors in my space helps keep my creativity sparked. 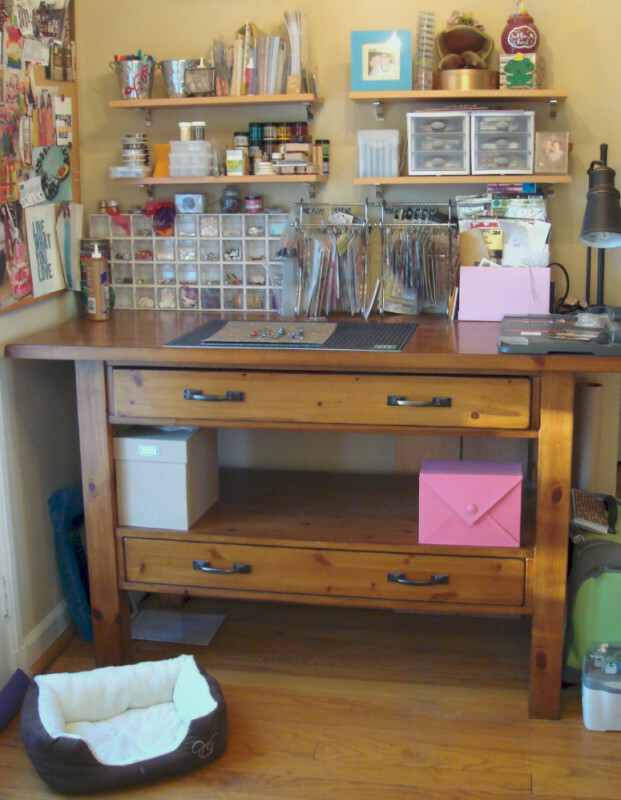 The desk is originally my scrapbooking space. (I still have all of my tools, bits and baubles lying around which is my constant reminder to finish some of my work). My organization fluctuates between having everything out on my desk where I can see it to having it all tucked away. Right now, everything is in its hiding space which is helping me to focus on what needs to be RIGHT now versus being distracted – it’s the holiday season, no time for distraction! Is there one thing that you absolutely love about your space? My favorite part of my creative space is my desk. 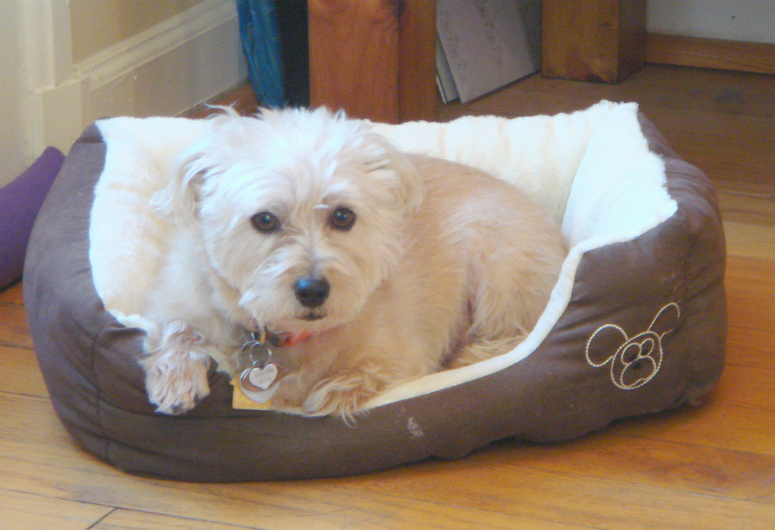 I stalked that Pottery Barn desk from the moment I first spied it in the catalogue. Unfortunately, it was WAY over my budget. But that didn’t stop my determination to own it . I watched every email, every catalogue until the glory moment – SALE! Then I cashed in all of my rewards points for gift cards and bought it for only $99. As if it couldn’t get any better, I bought it during a free delivery promotion! What would you love to add to your space in the future? I would love to add a small L-shaped desk for my shipping corner. Right now, most of my jewelry boxes remain in the box they arrived in along the wall. I’d also love to get better lighting. Since I work a lot with paper, natural light is my enemy when its around for long periods of time. Because of that, I try not to have my drape open while working which is why I need a better lighting solution. Anything else you would like to add or tell us about your work space? A big thank you to Kate and Moose for giving us a sneak peak into their office space! PS – if you are interested in showing off your studio space – get in touch for more details! It is Thursday of my vacation week and I have been a busy bee working on my own biz all week. Between sewing and catching up on my online class – it has been a full week of fun, but also a bit of overwhelm at times. I have, however, been able to remove that word from my vocabulary and move on. How? Well, with a small reminder from myself that this is what I love to do and I have been able to do it freely all week; and, when I am working my day job, I can still come home and do something that I love! 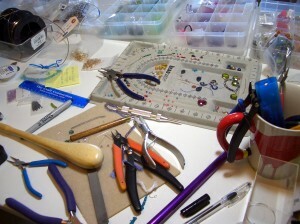 So, when I get into my jewelry groove, tools & pliers are everywhere on my main work desk – they start to multiply like bunnies. My gemstones are somewhat in order thanks to my organizer boxes, and right here, right now, everything is where is needs to be – so I can focus on creating. 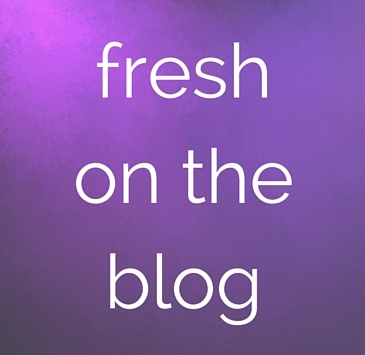 I am working on some new designs which will be unveiled soon – so if you want to be the first to know when they are available, sign up for my email updates at the top of this blog! PS – I am hoping to make this a regular post – so if you would like to show off your own studio or work space – leave a comment below – I would love to see your workspace!